Ametherm is a world-class manufacturer of an extensive variety of the highest quality thermistors as well as thermistor and RTD (Resistance Temperature Detectors) probes and assemblies. Ametherm's products are used in industries ranging from automotive, consumer electronics, food handling and processing to medical electronics, military/defense and aerospace. Customers worldwide use our temperature sensors in their most demanding temperature sensing applications. 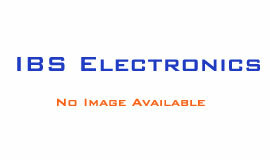 IBS Electronics is a Ametherm authorized distributor. As a ISO 9001:2015 certified distributor of electronic components you can trust IBS Electronics to offer you the best prices on Ametherm's thermistors and the highest level of quality assurance in the industry. Ametherm, established in 1994, manufactures rugged Inrush Current Limiting Thermistors and NTC Thermistors for temperature compensation and control. Ametherm plant is located in Carson City, Nevada USA is equipped to proccess raw materials such as manganese, copper, cobalt and, nickel into the substrate materials that protect power supplies, AC motors, and audio amplifiers all over the world. Ametherm has maunfacturing facility in Carson City, Nevada. Since 1994, Ametherm has manufactured Inrush Current Limiters that have changed the industry, one innovation at a time. From their locally owned and operated Carson City, NV HQ, they have produced a variety of products for markets such as Power, Medical, Automotive, and Aerospace Markets. Made in the USA, Ametherm is an ISO 9001:2015 company with thermistors that are UL/CSA approved, REACH Compliant, and RoHS Compliant (with some exemptions). For the past 20 years, we have kept our focus on Customer Service and have grown exponentially as a company- recently acquiring the SG/NTC Chip & Disc line from Measurement Specialties (Formerly RTIE). These thermistors offer a highly accurate and stable temperature sensing capability for applications such as temperature measurement or compensation, and can be mounted into a variety of probes and assemblies. 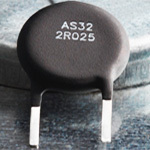 The new AS series of ICL thermistor dissipates between 25% to 43% less power than standard inrush current limiters with the same current and resistance ratings. This means that these ICL thermistors run cooler at Imax compared to conventional thermistors, which in turn increases their longevity. Surge currents that occur when electrical circuits are switched on can cause serious damage to sensitive electronic components if their rated current values are exceeded. 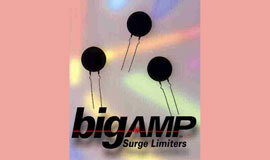 These surge currents can be controlled and eliminated using the MegaSurge inrush limiters. Surge currents which occur when electrical circuits are switched on can cause serious damage to sensitive electronic components which may exceed their rated values unless the surge is controlled. Damaging surges may be prevented by using Surge-Gard inrush current limiters. Surge currents that occur when electrical circuits are switched on can cause serious damage to sensitive electronic components if their rated current values are exceeded. 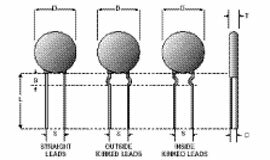 Damaging surge currents can be prevented by placing an Inrush Current Limiting (ICL) thermistor in series with the load, thereby protecting critical parts of the circuit. A range of 0402 surface mount NTC thermistors. A range of 0603 surface mount NTC thermistors. A range of 0805 surface mount NTC thermistors. The miniAMP series is designed for applications where board space is limited and cool operation is desired. The cost effective miniAMP inrush current limiter is an efficient way to protect components such as relays, diodes, and fuses from inrush current. The miniAMP series is available in 3, 5, and 8mm diameters and weigh as little as .06 grams. 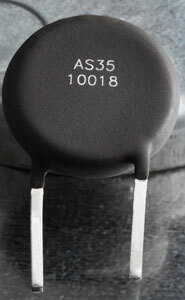 The miniAMP series cold resistance ranges from 5 ohm to 220 ohm. There are many potential applications for NTC thermistors. Their accuracy and stability make them highly useful for a wide range of purposes. These applications include temperature measurement, compensation, and control. NTC thermistor probes are generally used as resistance thermometers. They are extremely versatile and accurate, which makes them ideal for a wide variety of applications that measure temperature. Thermistor probes work especially well for lower range of temperatures. There are many automotive and transportation, and military applications for NTC thermistor probes, including industrial process controls, emissions controls, and differential temperature controls. Thermistor probes can be used in automobile and truck tire curing, as well as for monitoring and controlling engine temperatures. They are even used in missiles and spacecraft. Some more potential equipment uses of NTC thermistor probes are for plastic laminating and hot glue, as well as fire protection and safety. Copy machines and industrial soldering irons both use NTC thermistor probes. Hot mold and chemical analysis equipment is another potential application for NTC thermistor probes. Other uses for NTC thermistor probes range from applications for sensor assemblies and industry to telecommunications, as well as many kinds of medical, laboratory, and scientific instruments and testing. They are used in fiber and photographic processing, solar, meteorological, geological, and oceanographic research equipment, as well as consumer and household appliances. You may well already have NTC thermistor probes being used in your burglar alarm and fire detectors, for your oven, air conditioning, refrigerator temperature control, or fever thermometer. There are more specific applications for NTC thermistor probes that include bathythermography, calorimetry, titration, spectrophotometry, osmometers, bolometry, and thermodilution. Potential instrumentation applications seem endless as well. NTC thermistor probes can be used for motor winding compensation, transistor temperature compensation, infrared sensing compensation, gain stabilization and piezoelectric temperature compensation. 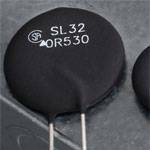 While the majority of NTC thermistor applications are based on their resistance-temperature characteristic, they can also be grouped according to other basic electrical applications. For example, current-time uses include time delay, surge suppression, and sequential switching. Among the voltage-current uses are vacuum manometers, anemometers, automatic gain, amplitude and level control, flow meter voltage regulation, liquid level control and fluid velocity, alarm volume, signal expansion and compression and thermal conductivity analysis as well switching devices and gas detection. Ametherm's NTC Thermistor probes can be used for through-hole applications, temperature detection and compensation, as well as circuit protection. 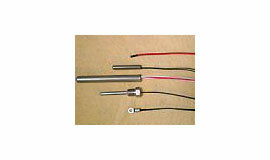 There are NTC thermistor probes available to fit nearly any design or desired application. Ametherm's NTC Thermistor probes are all rugged and reliable over a wide temperature range and built using high temperature materials for long life and durability. Our NTC Thermistor probes are also available in several custom configurations. Ametherm certifies all part numbers that they supply to our customers are compliant to Reach 169 substances listed as substance of high concern as outlined in Annex IV SUHC of the Reach regulation (EC no 1907/2006) updated 2016. 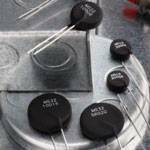 All of Ametherm part numbers are ROHS 204/65/EU and ROHS II compliant with exception of 7a. Ametherm both respects and obeys the Dodd-frank law of 3TG by using authorized tin smelters or refiners.